Obituary – Pellow, Claire Elizabeth (Bowles) « Perry High School Alumni Association, Inc.
Forensia, Glee Club ’24, D.D.D., Girls’ Quartette ’23, ’24, All-School Play ’24. Former Perry resident Claire Eliza­beth Pellow, 88, died Wednesday, Jan. 22, 1997, at Castle Rock, CO. Burial of remains will be in Grace Hill cemetery at Perry under direction of Parker Funeral home. Mrs. Pellow was the daughter of Judge William Bowles and his wife, the former Clara Schrader. She was born in Perry on Oct. 22,1908. She attended Lindenwood college in St. Charles, MO., for two years followed by a year at the University of Oklahoma, where she was a member of Kappa Alpha Theta, a national social sorority. 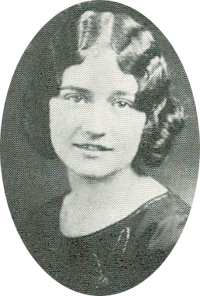 Returning to Lindenwood college for her final year, she received her bachelor of music degree in 1929. She and Andrew David Pelot (also spelled Pellow) were married May 25, 1929, in St. Louis, where he was employed as an engineer. They made their home in St. Louis. Mr. Pellow preceded her in death in 1965. While a Perry resident, she sang in the First Presbyterian church choir. She sang in a trio with Jimmy Dorsey and Wayne King. She also sang with the St. Louis Opera. Mrs. Pellow was a retired social worker who resided in Parker, CO, and formerly lived in Tulsa. Survivors include two daughters and a son-in-law, Sara and Frank Novachek, Parker, CO, and Nancy Ann Drake, Tulsa; and a sister and brother-in-law, Mary and David Maughan, Minnetonka, MN. Mrs Pellow’s brother, the late Edward Bowles, was a Perry postmaster.